Thank you to @seekingzamonia for this gorgeous picture. This weekend we are getting all geared up for watching the royal wedding because any excuse to buy union jack cupcakes in bulk is ok with us! 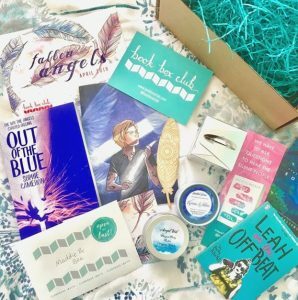 As we are in the spirit for celebrating, we thought it was time to show you the contents of our April Fallen Angels themed box. As soon as we finished reading this beautiful book we knew that we had to share it with you all. Anyone who has already finished reading our April read will know; it’s so unique! Despite the fantastical subject matter it feels very contemporary and strangely believable and it had us sobbing at the end. We can’t wait to hear what you all thought of it and to discuss it in our Clubhouse book group at the end of the month. 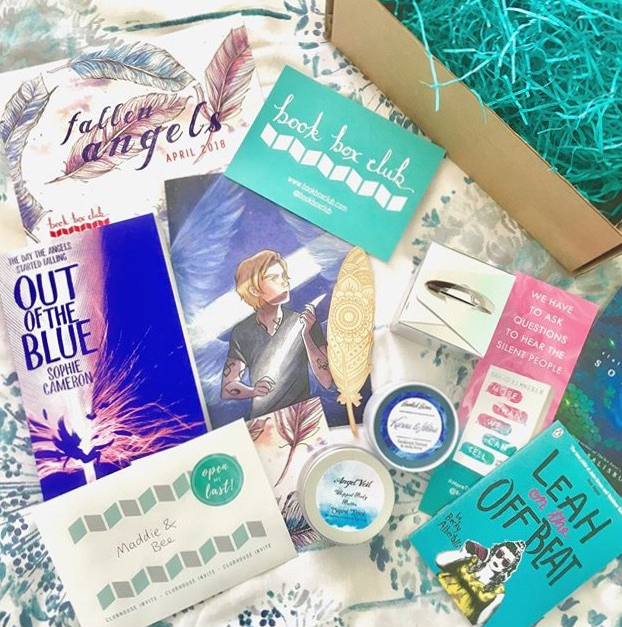 We had so much fun finding angelic goodies to include in this box and we were particularly excited to be able to include items from some of our favourite under-represented fandoms (Daughter of Smoke and Bone and Buffy). As ever, we’ve been overwhelmed by the talent and brilliance of the small businesses who have crafted goodies for our April box. The day we had boxes and boxes filled with Tunnocks Teacakes arrive on the doorstep must have been one of our favourite Book Box Club moments ever and, because we are such huge fans of this chocolatey treat, Graham from Tunnocks was so lovely in sending us lots of extras (just in case! )…what an angel! In all seriousness, we have had lots of lovely people help us make this box great and we’d like to take this opportunity to thank every one of them! Thank you to @maddieandbee for this gorgeous unboxing photo! Clubhouse Invitation: Join us for our online book group (AKA heaven for the unashamedly bookish). Ask your questions to the lovely Sophie Cameron and make new friends with the Book Box Club angels/demons/members! 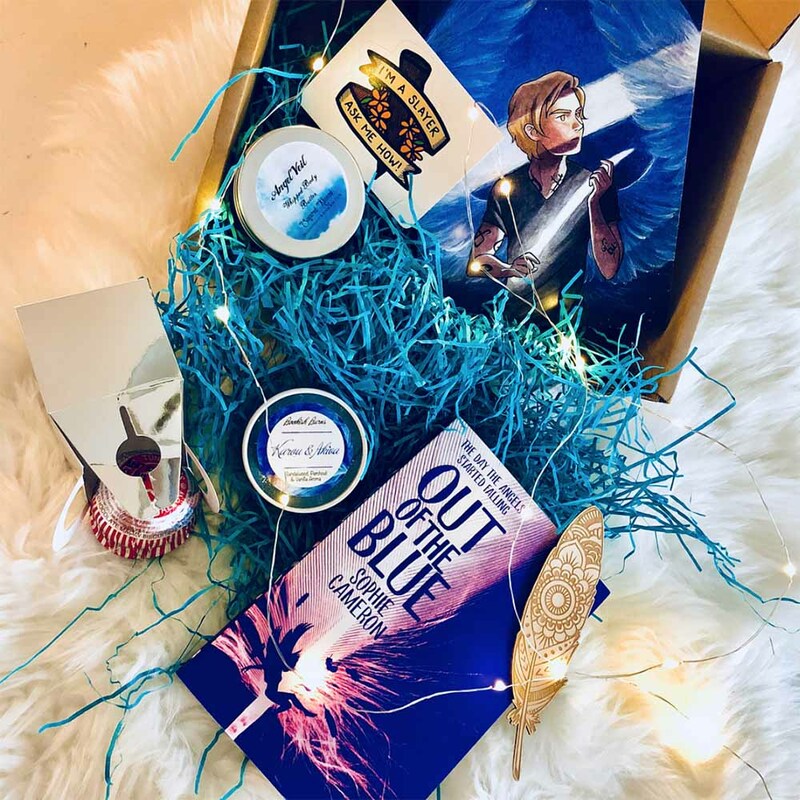 Karou & Akiva candle by Bookish Burns: Create a heavenly haze with this exclusive sparkly candle, scented with sandalwood and patchouli, and inspired by the otherworldly couple at the heart of Daughter of Smoke and Bone. Jace Notebook by A Traveling Sketchbook: Keep all of your Shadowhunting notes in order with the help of our favourite Nephilim, Jace Wayland, as imagined by our awesome arty buddy Nova of The Traveling Sketchbook. Bookish Extras: A few little extras to celebrate brilliant new YA releases from our publisher buddies, including a poster for The Gloaming by Kirsty Logan and a sample of Leah and the Offbeat from Penguin Random House, More Than We Can Tell bookmarks from Bloomsbury and Out of the Blue postcards from Macmillan. Thanks to all our lovely members for sharing your photos, blogs, You Tube videos and reviews this month. You guys are absolute angels. JUNE BAD GIRLS BOXES ARE ON SALE NOW! Our June featured read! This gorgeous paperback follows a group of book-loving teenagers united by their shared obsession that will lead them to question the blurred lines between reality and fiction and pull them deep into a world of privilege, notoriety and manipulation. You can be sure of one thing when reading this book… you can’t trust anyone! This addictive read is a stunning contemporary paperback perfect for fans of (previous Book Box Club read) One of Us is Lying, We Were Liars and After the Fire. A BONUS BOOK! We are thrilled to have the chance to share a hotly anticipated fantasy ARC that won’t be published until October (!). Our bonus book tells the story of a badass band of female monster hunters who are bad girls at their most blood-thirsty! *The bonus book will be included in Book Box Club boxes only and not Purely Books parcels. A whole bundle of bookish goodies! This month items will be inspired by some of our favourite ferocious females in fiction and created by talented crafty people including the very talented illustrator Kristin Askland whose illustration features our favourite literary bad girl ever! Stand by in the coming weeks for more sneak peeks. A signed bookplate from the author and, of course, an invitation to our members-only online book group! We are already so hyped to discuss our June book with you all! We only have a limited number of June BAD GIRLS boxes left, so if you haven’t already secured your membership then click here to join us.